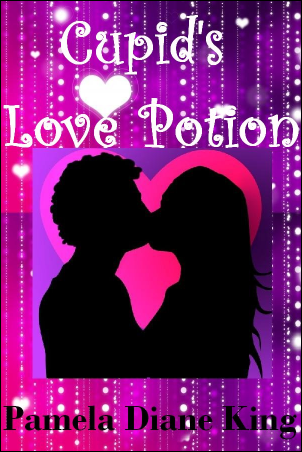 Editor's Note: This is chapter 2 of Pamela's middle-grade novel Cupid's Love Potion. Chapter 1 appeared in last month's issue. The complete novel may be purchased at Pamela's website: pameladianeking.com. On the weekend, Liz came over to my house for a sleepover. Apart from Chase, sleepovers were my main thrill in life. Liz and I always had movie marathons. I liked to watch musicals and chick flicks, while she chose dramas. She usually let me watch what I wanted, but she drew the line at Disney movies. I always made her watch my Carson concert DVDs and music videos. I knew that she secretly liked watching their concerts, because she had a crush on Chase's younger brother, Nick, who was our age. But she wasn't in love, like me. "Liz, I had another dream about Chase last night. I think it's a sign." "What do you mean by a sign?" she asked casually while unpacking her toiletries in my connecting bathroom. "That what I desire is getting closer." I pointed to my pictures. "Tell me about your dream," she said, sitting on the other side of the bed. I lay down. It felt like Liz was my Psychologist and I was having a therapy session. We just needed one of those couches. "Like the other dream, I went to one of Chase's concerts. I looked really good, so I knew that he would notice me. He saw me in the crowd and immediately focused on me. I could tell that he was majorly checking me out. I felt like butterflies were fluttering in my stomach. He put his hand out to me, but instead of waking up at that point like I did the last time, the dream carried on. So then, he pulled me up on stage and the spotlight shone on us while he sang our song 'Love Struck.' You know it's that love song that I've always thought was our song because he sings, 'Lost in your green eyes, whatever it takes I'll do, 'Cos I knew I loved you, the first time I saw you.' He sang the whole song to me. He held my hand and only looked at me as he sang, like he really was 'Love Struck.' It felt so real. I could actually feel the emotions, like it really was happening, and I felt like I was floating on a cloud. Now that I know how it feels for him to want me too, I want him even more. He looked so hot in my dream. Why can't I just live in my dream?" "Umm Hmm ..." Liz nodded, and tapped her finger against her cheek. She had been listening attentively without interrupting. "So, what do you think the dream means?" "Aren't you supposed to tell me that?" "No, dreams have very personal interpretations. It mainly depends on how you feel in the dream, what emotions you experience." "Well, Dr. Freud, I think that my dream is definitely a sign that I'll meet Chase soon, and possibly a sign that we're soulmates." "You could be right. Life is full of surprises," she said philosophically. "You're usually more realistic. What happened?" I asked suspiciously, narrowing my eyes. "I just have a feeling that maybe the Law of Attraction really works. Or maybe it's our prayers that get answered." "I always feel better talking to you. I know that you won't judge me, even though you are the voice of reason. It really helps to get stuff off my chest." "I'm glad you feel better talking about it. Was that your phone or mine?" Liz said, reaching for her cell phone in her handbag. "Mine," I said, looking at my phone on my dressing table. It's a text from Ben." "Hmm ..." Liz tapped her chin like she was analyzing the deeper meaning. "Nothing ..." she said innocently. "He just said that he hopes I'm having a good time at the sleepover, and that he was thinking of me." "You can stop with the Freud act, Liz, the therapy session is over." "Did he end the text with 'L-U-V,' or 'L-O-V-E,' or what?" "Well, if he used the first one, then it means friendly love, but if he used 'L-O-V-E,' then that means, well ... love." "He ended it with 'L-O-V-E.'"
"Hmm hmmm ..." She nodded, very interesting. I sighed, and hid under my duvet. "You're taking this whole Freud thing too far." Earlier in the day, Liz had come with me to buy the new edition of Teen Idol magazine. I always got it on the day it came out. I'd stuck a poster of Chase on the bit of space that I could find on my wall above my bookcase. "Phoebe, every time I come to your house, there's a new poster added to your collection," Liz said, examining my Chase wallpaper. Liz's room was the opposite of mine. "Well, at least I don't only have framed pictures of flowers and plants on my walls. I have never understood how people can enjoy looking at giant close-ups of plants everyday." "Hey, I resent that." She hit me with a pillow. I brushed my hair out of my face. "Well, I prefer looking at faces, especially one in particular." I looked at the pictures of Chase covering my bedroom walls. "My mom says that she can't even remember the colour of my bedroom walls anymore, but we both know they've been light pink since I was a baby. But I think it's artistic." "I stuck this poster of his face on the wall next to my bed, so that he can sleep next to me at night," I said, caressing Chase's face. "When I'm falling asleep, I feel better knowing that he's there. I also like that his face is the first thing I see when I wake up in the mornings." Liz raised an eyebrow. "You need a real boyfriend, because I'm starting to worry about you." "The Chase collage on my walls actually serves a purpose. Remember what the Law of Attraction says?" "That we are all connected by energy." "You're very Zen today. Anyway, it says that in order to attract something to you, they say that you should create a vision board with the pictures of what you want to attract, and stick it where you will see it often. So, I have a vision wall, instead of a vision board. My theory is that a whole wall, or four walls, should be even more powerful than a vision board. But that's not the reason I put the pictures up; I just like to look at him." "Look at these pictures of Chase posing with fans. I hate seeing pictures of Chase with other girls. When I do, I feel like ripping them up," I said, poking the magazine with my index finger. "Phoebe, that's a six-year-old girl, how can you be jealous?" "Not that picture specifically, but all the others. I wish that I could take a photo with him, and then I could frame it and put it on my bedside table. That would be even better than the poster on my wall next to my bed. Once, I cut Chase's face out of a magazine picture and pasted it over Ben's face on a photo of us. I showed Ben, and I was surprised by how upset he got. I mean, it was only a picture." Liz looked at me straight in the eyes. "Phoebe, you must have really hurt Ben. Chase isn't the only sensitive guy in the world," she said directly. I shrugged. "He got over it." "Don't be so sure," she said under her breath. I brushed her off. "There's an article accompanied by a picture of him and Alicia Spark at the Teen Choice Awards." "Excuse me. Did you just say that you don't know who the pop princess is? Have you been living under a rock or in a cave for the past few months?" I asked in mock horror. "I think even Eskimos living in igloos know who she is." "You're so dramatic. It's just that I find pop culture quite dull," she said, continuing to read her favorite magazine, I Love Chemistry, that she had also bought that day. "There are real problems to worry about in the world, such as global warming." "I do worry about global warming, I'm very environmentally conscious. I always recycle." "Well, that's a start, I guess. So who is this superstar?" "Alicia Spark is a blonde teen pop star who thinks she's all that. I've never liked her because she dresses like a stripper, even though she's only 15. In interviews the only things she talks about are clothes and her looks," I explained critically. "She sounds like Amber." 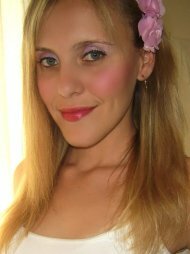 Amber was the most popular girl in our grade, the most beautiful, and the ultimate "mean girl." She also had a major thing for Chase. "Exactly, that's another reason why I don't like her," I said dryly. "The article says that 'sources' have revealed that Chase and Alicia are dating. They have apparently been spotted having romantic lunches together, and 'frolicking' on a beach in Malibu. I know that's not true, and I think that I should write to them and tell them that the word 'frolicking' is so 1950s. No one believes gossip like that, and who are these so-called 'sources' anyway?" "You always believe what these magazines say," she corrected. "Remember that time you believed that Chase was going solo because his brothers were becoming monks." "Well, not this time," I said defiantly. "They must have just made it up to sell magazines. Chase is such a sensitive soul. I know that he would never date someone as vain and superficial as Alicia." "They do look good together though," she said, admiring the picture. "Traitor," I joked, snatching the magazine back. "There's also an interview with Chase, but I already know all about him. I even know all about his brothers and his parents." "Why do you need to know about his parents?" "So that when he takes me home to meet them, I can make a good impression, of course." "I should have known," she said sarcastically. "Chase and I suit each other perfectly. We have so much in common. His favorite food is pepperoni pizza, and I love pizza. His favorite color is green, just like my eyes. He lives in Los Angeles, California, and I live in Orange County, California. He loves animals, and who doesn't love animals? He has two dogs and a horse, and I have two dogs and a goldfish. His favorite musician is Michael Jackson, may he rest in peace." "Wow, did you do a background check or something?" she asked with a smile in her voice. "No, I just like to learn as much as possible about my future husband, the love of my life, my soulmate," I said exaggerating. Then we both burst out laughing. I liked making people laugh, but I only liked it when they laughed at my jokes or at something funny I said, not at me. Liz and I were listening to the top 100 hits on the radio and reading our magazines, when there was an announcement on the radio. "Oh my word!" I screamed, jumping around the room. "What did I miss?" Liz had been lost in her Chemistry magazine, so she had missed the earth shattering news. "Carson is doing a concert this Saturday in Orange County! Liz, this is definitely fate. I think that my dreams were premonitions, and I must be psychic." "I think that your dreams are more like wishful thinking." "Back to your old rational self, I see. Well, either way, my dreams are coming true! Tickets are selling fast, so I'm going to go ask my parents if they can get me an extra birthday present. They know how much this means to me. They can't deny me my greatest wish. I'll be back in a minute." I found them watching TV. "Mom, Dad, you know how much I love you." They exchanged a knowing look. "What is this about?" my dad asked with a hint of a smile, clearly seeing through my act. I explained to them about how much the concert meant to me, and about how I would cry myself to sleep every night if they said no. "Life is so cruel!" I moaned, collapsing on my bed. "They said, and I quote: 'Something as expensive as a concert ticket needs to be earned over a period of months.' Months! I don't have months, I have days! Do they even have hearts? This is my future happiness we're talking about. Does that mean nothing?" "Maybe they'll change their minds," Liz offered optimistically. "Trust me. I've known them for 15 years. Once they've said no, it means no," I said burying my face in my pillow. She rubbed my arm. "Let's watch Dirty Dancing. I know how much you love it. I'll make some popcorn." "Thanks Liz." I looked at Chase on the cover of the magazine, and then put it under my pillow. But he was still the only thing I saw.